This week I went to my local Mexican market in Pittsboro, NC in search of dried yellow beans to create another batch of soup. They store them in a bin and sell them by the pound. I love their color and texture. (Beans were originally cultivated in both Mexico and the Andes.) Yellow beans are a staple in Mexico along with black, red, and pinto beans plus about fourteen other varieties. The soup pot is on the stove ready and waiting for Thanksgiving Dinner. 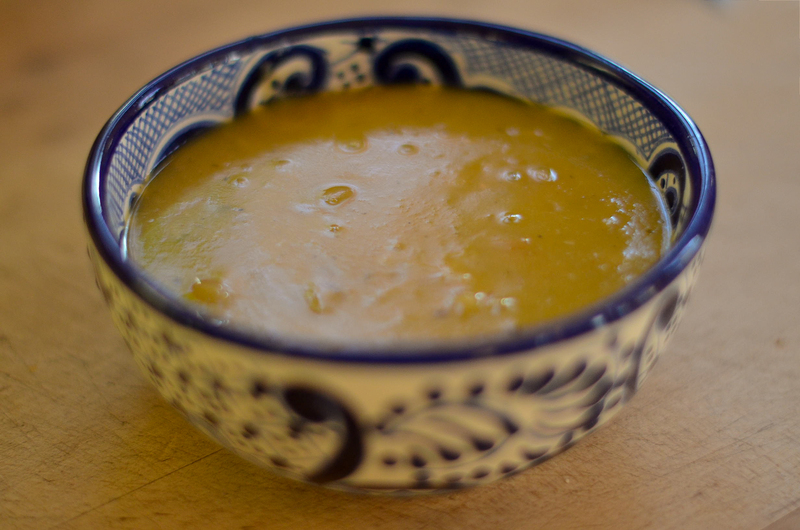 This is a rich, deep golden soup that goes with all the autumn colors of the season and your Thanksgiving table. Viva Mexico for giving us beans! 1. Preparing the Beans: Rinse and clean the dried beans. Bring 4 C. water to a boil. Add beans to the boiling water. Cook until the water returns to the boil. Drain and rinse with cold water. Rinse out stock pot. Return parboiled beans to the pot. Set aside. 2. Onion and garlic: On a comal (thin griddle) or in a wok, grill the onions and garlic over medium high heat until slightly blackened and seared. They are done when the juices begin to flow on the onion and the garlic inside its husk will be softened. Husk the garlic — it will slide right off. Put the whole, peeled clove into the stock pot with the beans. Add the onion to the stockpot. 3. Carrots, Turnips, Parsley, Peppers: Add the carrots, turnips and parsley to the stockpot. Crumble the peppers and add them to the stockpot. 4. Add 6-8 C. cold water to stockpot to cover the bean mixture. Add sea salt and stir. Bring to a simmer, cover and continue to cook until beans are soft. Check every 15-30 minutes for doneness. 5. With a large slotted spoon, remove all the carrots, turnips, onion and garlic to a blender (do not use a food processor). Remove about 3/4 of the beans and add them to the food processor. I have left about 25% of the beans whole in the pot to add texture to the soup. 6. Add enough water to the blender to cover the mixture. Use the PUREE setting and puree until the mixture is smooth. [Your stock pot should have some beans in it along with the cooking broth.] Add the puree mixture to the remaining beans and broth in the pot and stir well. 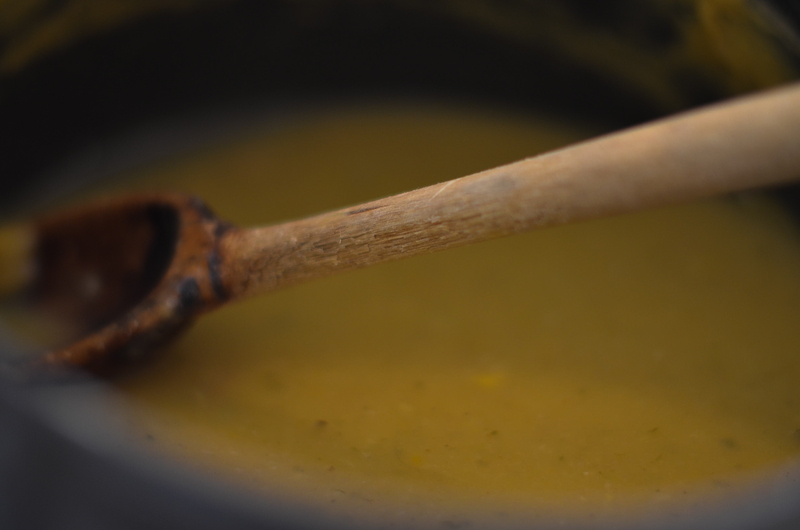 Add additional water to bring the soup to the thickness you desire. Bring to simmer. 7. Correct the Seasoning: Taste. Add additional salt if needed. You may also choose to add some cayenne pepper (careful, not too much), starting with 1/4 t. to give the soup more punch. Stephen’s Grandmother’s Spoon stirring the pot. Three generations of cooking. Have a Happy Thanksgiving. I’ll be continuing to post more Day of the Dead Photography Expedition photos tomorrow, since I don’t participate in Black Friday. This entry was posted in Food & Recipes, Oaxaca Mexico art and culture and tagged blogsherpa, Mexico, Oaxaca, Soup, yellow beans. Bookmark the permalink. Happy Thanksgiving, Norma! Hope you are enjoying being back here in NC for a while. Your bean recipe looks great–I’ll try it. Still hoping to get down Oaxaca way sometime but next trip South is to Nicaragua, to stay in a casita in Granada. Enjoy your blog–there are many of us ‘out there’, I’m sure, even if we don’t always respond. Where in Pittsboro is the Mexican market? My parents live in the Pittsboro/Chapel Hill area, and I’d love to check it out the next time I visit them. Hi, Anna Maria, there is a small Mexican market on Hillsborough Street directly across the street from Second Bloom Thrift Shop and The Joyful Jewel. It’s in the block before you get to the courthouse circle on the right side of the street if you are coming from Chapel Hill. It’s a very small market. There are more fully stocked Mexican markets in Chapel Hill (one on Main Street in Carrboro) and in Sanford. But this is my local source and very convenient, so that’s the one I usually stop at. I just wanted to say Happy Thanksgiving and thank you for your blog. Your coverage of Oaxaca and Mexican culture is interesting and informative. I have enjoyed all of it…Day of the Dead photos, recipes and your narrative direct from Oaxaca. Someday I will take that lost wax silver casting workshop. Regarding Black Friday. I think there are lots of us who are just amazed and dismayed at the encroachment upon our national holidays by the crazed quest for sales of the big box stores. And people do it!! Here in Portland, many of the independent retailers have banded together to form LittleBoxesPDX. If you are going to shop,at least shop local and small whenever you can. But the larger question is, why can’t we just relax and enjoy our families and friends on Thanksgiving and the day after?